One of the important tool categories in GeoTools / CADPower is conversion tools, which allows you to convert CAD data from one format to another. Conversion can be of two kinds - from one file format to another (example: .dgn to .dwg) format, or within the drawing environment itself (example: xdata to attributes, object data etc). V 13.06 of GeoTools/CADPower released yesterday packs a number of useful enhancements, fixes and a completely new command. ** New command added: GT_XD2OD (GeoTools -> AutoCAD Map Tools -> Convert Xdata to Object Data [generic tool]) : The GT_XD2OD command is yet another generic data conversion tool in GeoTools/CADPower. 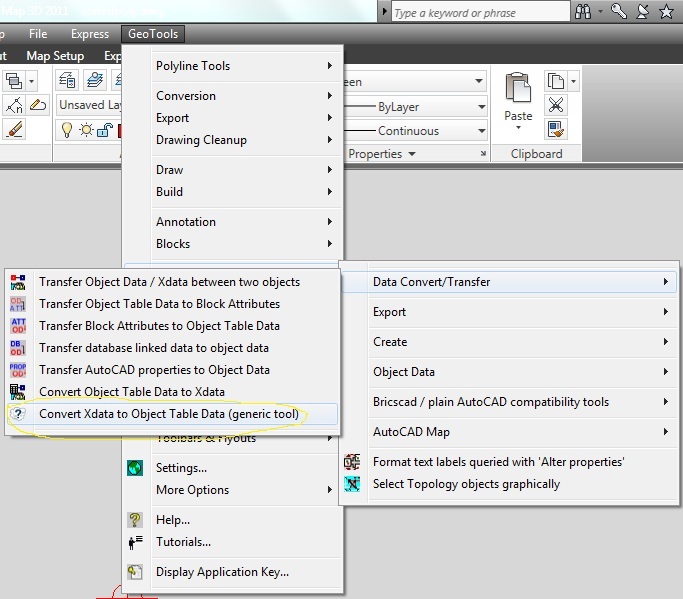 Using this, you can convert extended entity data to AutoCAD Map object data. To make it easy for you to understand and try this feature, here is a sample drawing Sortedpoly.DWG with which you can try this command . Here is an example of XDATA record structure from the sample DWG comprising of 33 records from a GPS data logging device. In other words, you choose the XDATA code as 1000 and the occurence as 3. After that, you specify the object table and the field to which this must be mapped. Please be aware that the type of the XDATA field must match the type of the object data field for the transfer map to be valid and successful. For example, character XDATA codes 1000 and 1001 can be linked to character object fields only, 1040 can link to floating point field only and 1070 can link to integer data field only. From V 13.06 onwards, you no longer have to fiddle around with the acad.lsp or acaddoc.lsp (for AutoCAD) or the 'on_doc_start.lsp' (for Bricscad) to ensure that both GeoTools and CADPower run together successfully on the same computer. In one of my earlier post, I showed you a bit of fiddling around that was earlier necessary to ensure that both these software ran together without problems. This fiddling bit is now handled by the program internally and automatically. Many of our existing users of GeoTools are still on Version 10 and very happy and contented with it. Some of them want to upgrade to the latest V13 platform but do not know what the new features are. In this post, I have compiled a list of all the new features, bug fixes, enhancements made in V11, V12 and V13 of GeoTools and CADPower. GeoTools V11 is the first version of GeoTools to be compatible with AutoCAD 2011. 1. GT_PARTSTRETCH (GeoTools Polyline ToolSet 1 Stretch part of a polyline): A bug has been fixed in this command which caused malfunction of the command when the first segment of the polyline was picked for stretching. 3. GT_PARTOFFSET/GT_PARTCOPY/GT_PARTRESHAPE/GT_PARTROTATE/ GT_PARTSTRETCH (GeoTools Polyline ToolSet 1): All these commands now set and restore their OSNAP setting. 4. GT_XFER_OD_XD : (GeoTools AutoCAD Map Tools Transfer object data / xdata between two objects) : This command caused a crash in plain AutoCAD. This has been fixed. 5. GT_ALIGNTEXT (GeoTools Text Tools Align Text Objects) and GT_ALINGTEXT2LINE (Text Tools -> Align Text Objects to a line): These two commands now call and run correctly from the pull-down menu as well as the toolbars. Until now, they were calling a wrong command name and displaying a message to the effect that the command name has changed but with no offer to run that command. 6. GT_OD2XD (GeoTools AutoCAD Map Tools Convert object data to Xdata) : This command would not work correctly if there was only one object table in the drawing if the user clicked Ok without selecting it with a mouse click. The implicit, autmoatic selection of a single object data table was not working. This has been fixed now. 7. General change: All commands that require a block to be inserted would work correctly only if the block was defined with the default setting of "Non-Uniform scaling". If this default was changed and a block created with "Uniform XY Scaling", the block insertion would not work correctly in certain AutoCAD versions. This has now been fixed. A number of other small bugs have been fixed and improvements made. 8. General change: The AutoCAD menu bar with the GeoTools menu is now made visible automatically upon loading GeoTools. Tip: In the event you do not see the AutoCAD (and GeoTools) menubar, type MENUBAR on the command line and set the value to 1. 9. GT_IMPEX (GeoTools Export Import/Export points and lines) now provides an additional option under the 'Export Options' dialog box called 'Append object handle to the exported record'. If this option is checked, the last field in the exported record will be the object handle. When used in conjunction with the GT_HNDLABEL command, the handle export can be used as a means to correlate visually between the records in the ASCII file against the objects in the drawing. 10. The GT_MREDEFINE (GeoTools Block Tools Multiple Redefine Blocks-Lyr/Clr) command updates block definition - color, layer, elevation and thickness of objects. A new option 'LineWidth' has been added and this command will now update line widths of lines, polylines and arcs within the block definition. 11. The GT_IMPEX command (GeoTools Export Tools Import/Export points and lines) now supports additional options for import/export. You can specify 'Start' and 'Stop' codes for linear records. A Start or Stop code is added to each linear record at the beginning or end of the record and denotes if the point in question is the last point or not in a linear sequence of points. 12. The GT_AUTOINCROD command (GeoTools AutoCAD Map Tools Create auto-incrementing object table data) now has an additional option to assign incrementing object table data in a X/Y sorted manner. With options similar to those provided by the GT_SORTEDPOLY command, you can now assign incrementing object data with X/Y coordinates sorted. 13. The GT_ANNOGRID (GeoTools Civil Tools Create map grid): use supporting DWG files which used to be located in a common folder called 'BLOCKS' under the GeoTools installation folder. Anticipating that commands may need to use their own support files in the future, a new folder called "Support" has now been created under the GeoTools installation folder and all support files specific to each command will be placed in a folder by the name of that command. 14. The GT_VEGLINE command (GeoTools Draw Tools Draw vegetation cover symbols) now offers 6 pre-defined PAR files which are useful to draw vegetation symbols for (T)rees, (S)hrubs and (H)edges, with scales of 1:200 and 1:500. The names of the files are HPOLY500.PAR, TPOLY500.PAR, SPOLY500.PAR, HPOLY200.PAR, TPOLY200.PAR and SPOLY200.PAR. You can use these files as a guide to set GT_VEGLINE parameters which are suggested best fits for the type of vegetation and the scales. If you don't like the parameters, feel free to save your own and retrieve later. 16. The GT_ENCLOSE command (GeoTools Text Tools Enclose Text in Box): The GT_ENCLOSE command now supports additional options to enclose text objects. You can now use either a WIPEPOUT, SOLID or 3DFACE object to create the enclosing bounding box. These are provided under the 'Box' sub-option and closely mimics the AutoCAD TEXTMASK command. 17. The GT_LAYERMAN command (Geotools Miscellaneous Tools Layer Names Editor): Two additional options have been introduced 'Add at Position' and 'Strip at Position'. These two options allow you to add or remove a specified number of characters from the layer name starting from a specified position. 18. The GT_SURFAREA command (GeoTools Miscellaneous Tools Compute surface area of 3dFACEs): can now be used to optionally create 'projected' 3DFACE objects on the XY plane, when you choose the option 'Projected(horizontal)' area. This is in addition to the projected area reporting that is performed by the command. 19. The GT_INSVX command (GeoTools Polyline ToolSet 1 Insert vertex) : Until now,you were only able to add a new vertex at a point on the existing segment of the polyline. The GT_INSVX now allows you to pick a point outside the polyline and a new vertex will be added at the picked location. The segment closest to the picked point will redraw itself to include the new vertex. 20. The GT_FLIP command (GeoTools Polyline ToolSet 1 Flip(reverse) direction of polylines): The GT_FLIP command has been made more intuitive, with clearer dialog descriptions. A bug has been fixed which affected 2- vertex polylines. Additionally, support for LINE objects has been added when 'High-2-Low' and 'Low-2-high' options are chosen. 21. The GT_ENDELEVCHECK command (GeoTools Drawing Cleanup Tools Check for coincident (XY) endpoints with varying Z):The GT_ENDELEVCHECK command now provides an option to create a single 3d polyline from the joined objects. 22. The GT_3DJ command (GeoTools Polyline ToolSet 1 Join 3D Polyines) : The GT_3DJ command now allows LWPOLYLINE objects to be selected as inputs. You can now provide a combination of light-weight, heavy-weight polylines as well as lines and 3DPOLYlines as inputs for this command. 2. Some commands in GeoTools were incorrectly displaying a message "There is no license to run this command". This bug sneaked in during one of the earlier updates back and has been fixed now. 3.The GT_DRAPEPOLY (GeoTools Build Tools Drape a 3d polyline across a set of intersecting linear objects) command would freeze AutoCAD if a LINE object was supplied as a source object. This has been fixed now. GeoTools V12 is the first version of GeoTools to be compatible with AutoCAD 2012. The GT_COMPAREBLKATTS command has been enhanced. Until now, it was only capable of creating a report of block names in the drawing having identical tag names. It can now create a report of block attributes that have similar block attribute values as well. In other words, if you need a report of block attributes with unique values (number of such occurences), this is the tools to use. 2. GT_DELVX (GeoTools Polyline ToolSet1 Delete Vertex) : An 'Undo' option has now been added to both these commands which will allow you to undo each operation of vertex insert or delete without having to undo or redo the whole command. 3. (geo) (GeoTools Miscellaneous Tools More Enter geographical coordinates-Latitude,Longitude,Height): (geo) is a transparent function that can be used to input a geographic point. You can now input the latitude or longitude locational qualifiers like N, S, E and W following the value. For example, 55N 23 21, 25E 12 23,0.0 is now a valid input. N and E qualifiers are taken as positive coordinates, S and W qualifiers are taken as negative coordinates. Accordingly, the sign of the coordinates become positive or negative. Earlier, you had to specifically give a negative (-) sign in front of the value to denote the negative. This method is still supported. 4. GT_GEO_INS (GeoTools Miscellaneous Tools Insert a geo-referenced image): A bug has been fixed in this command which was causing a malfunction in the past few updates of GeoTools V11. Minor enhancements have been made in the default folder naming convention. The location for the 'World files' folder is now automatically set to the same folder where the image file was found. If your 'World Files' folder happens to be the same as the images folder, you just need to click on 'Ok' to the 'World files' folder dialog and proceed further. 5. GT_INSVX (GeoTools Polyline Tools Set1 Insert Vertex): A bug has been fixed in the GT_INSVX command. The Z value of the new vertex location is now the correctly interpolated Z value of the nearest point on polyline. Earlier, all new inserted vertices would acquire an elevation of 0.0. This has been fixed. 6. GT_IMPEX command enhanced: (GeoTools Export Tools Import/Export points and lines) : The GT_IMPEX command now has an additional option during import of points. You can specify a block attribute or object data field to receive the point elevation values. This is in addition to the transfer of 'Point Number' and 'Description' fields that be set as block attributes or object data fields. 7. GT_LAYERMAN command enhanced (GeoTools Miscellaneous Tools Layer Names Editor): The GT_LAYERMAN command now has an option to merge one layer into another. You can select multiple layers as source layers and specify one layer to merge all of them into. 8. GT_VIEWLINKED command (GeoTools Export Tools View handles-linked ASCII data) : The GT_VIEWLINKED command populates all records from the ASCII file into the dialog box. However, in Bricscad, there is a bug which causes a huge performance loss when trying to populate large number of records into the popup list of the dialog box. To prevent this, the GT_VIEWLINKED command will list only the first 3000 records of the ASCII file in the dialog box in Bricscad. 9. GT_PARTOFFSET command (GeoTools Polyline Toolset 1 Offset part of a polyline : This command now handles 3d polylines fully and the offsetted segment also is a 3d polyline. Earlier, partial offsets from a 3d polyline would result in a 2d polyline. 10. GT_BATCHPROCESS command (GeoTools Miscellaneous Tools Batch process multiple drawings with scripts: The GT_BATCHPROCESS command can now do a recursive search starting from the selected folder and all folders below it and will create a BATch file to process all the files in one go. The earlier method of selecting one folder and drawings within the folder is still available. 11. GT_PROFILE (GeoTools -> Civil Tools Draw cross- sectional profiles): The GT_PROFILE command now accepts multiple 3d polylines for profiling. This will speed up profile generation when you want to generate mulitple cross-sections in one go. 12. GT_TRIANGULATE (GeoTools Civil Tools Create TIN (Delauney triangulation): The GT_TRIANGULATE command now allows you to specify the layer in which the TIN triangles are created. 13 GT_SET_Z_PL : GeoTools Drawing Cleanup 'Set all 0 elevation vertices to the nearest value' has been renamed as 'Set out-of-range elevation values to nearest valid elevation values'. The command name stays the same - GT_SET_Z_PL. In this new, enhanced mode, the command provides a dialog box interface and the option to specify an 'out-of-range' value. It need not be only 0.0 like before, any value can be specified as the 'out-of-range' limit and all values below it will be replaced with the nearest 'in-range' value. The change in the command description reflects this. 14. GT_SEGLABEL (GeoTools -> Annotation Tools ->Label polyline segments): The GT_SEGLABEL command now has a new option to do bearing annotations. It is the degree-minute-second format in the style D°M'S". This has now been addded to complement the other available styles. Another addition is the 'Bearing@Distances' option. 15. GT_SET_Z_PL (GeoTools -> Drawing Cleanup -> 'Set out-of-range elevation values to nearest valid elevation values') : The GT_SET_Z_PL command has been modified and a new option has been added to delete the vertices of a 3d polyline which are 'out-of- range'. You now have the combined option to setting the 'out-of-range' elevations to their nearest valid value or simply delete that vertex. 16. GT_SEGLABEL (GeoTools -> Annotation Tools ->Label polyline segments): The GT_SEGLABEL command now has a new option to do bearing annotations. It is the degree-minute-second format in the style D°M'S" and is preceeded by a N and succeeded by a E or W depending on whether you are in the 0-180 or 180-360 bearing zone. 17. GT_MERGEPOLY (GeoTools -> Polyline ToolSet1 -> Merge Adjacent polygons): The GT_MERGEPOLY command has been fixed and enhanced. It will now always create a 3d closed polyline representing the outline of the selected adjacent closed polylines. Whether the original polylines are 2d or 3d, the resulting enclosing polyline is always in 3D, even if it means creating one with all vertices set to 0.0. Additionally, inside gaps (islands) are now recognized and appropriate island polygons created. There is also an option now to create the merged polygon on a user-specified layer. The program uses some standard internal settings for fuzzy tolerance and search parameters. If you are using very small coordinates (like geographic) and notice strange results, let us know for help. 1. GT_QUERYPROC (GeoTools AutoCAD Map Tools Format text labels queried with 'Alter properties'): The GT_QUERYPROC command was not doing an offset of the queried labels by the specified amount in case of linear queried objects. This has now been fixed. Labels queried with 'Alter properties' Query in AutoCAD Map now can be fully controlled - justification, position, direction, XOffset, YOffset etc. 2. GT_INSVX (GeoTools -> Polyline ToolSet1 -> Insert Vertex) : This command now handles the dynamic placement of inserted vertex properly. Any OSNAPs that were in effect at the start of the command will now be restored at the end of the command. 3. GT_SPL2PL (GeoTools -> Conversion Tools -> Convert splines to polylines): The GT_SPL2PL command would fail in Windows Vista and Windows 7 if the User Account Control was On and the DXF method was invoked. This is because the command was attempting to create a temp file in the C:\ folder. This has now been fixed and the temp file creation is now done in the Windows TEMP folder where the permissions automatically exist. 4. GT_IMPORT2DM (GeoTools -> Miscellaneous Tools -> Import 2DM files as 3dface objects): The GT_IMPORT2DM command had a small bug which caused a spike (due to wrong coordinates reading) during the processing of points whose records number was 1. This has now been fixed. GeoTools V13 is the first version of GeoTools to be compatible with AutoCAD 2013. CADPower V13 is the first version of CADPower to be compatible with AutoCAD 2013. We have added two new commands, one each in GeoTools and CADPower. In many ways, these two are related to each other but the purpose for which they might be put into use warranted that they go into two different products. This blog post explains them in detail. First, the CP_POLYGETZ command which goes into CADPower. The CP_POLYGETZ command in CADPower is located under the CADPower -> Polyline Tools, under the sub-heading Others. It can be used to perform elevation transfer operations from one polyline [target] to another [source] based on specific criteria. In this method, for each vertex of the target polyline, a 3D point nearest to it on the source polyline is determined. The source polyline is then replaced with a new polyine created using all such points which are essentially the nearest points (on the source polyline) of vertices of the target polyline. Therefore, this method results in the source polyline having exactly the same number of points as the target polyline but in the XY region of the nearest point on source polyline and the elevations belonging to the nearest target polyline vertex. In this method, each vertex elevation of the source polyline is replaced with the elevation of a point on the target polyline which happens to be the nearest point to it [the source polyline vertex]. In other words, this will result in the number of vertices of the source polyline to be the same but its elevation can change based on the target polyline elevations. The second command we introduced is the GT_POLYINSVX command, which goes into GeoTools. The GT_POLYINSVX command in GeoTools is located under the GeoTools -> Polyline Tools, under the sub-heading Process. This is a handy tool with various types of transfer operations possible between polylines and point features. For example, if you want to transfer point feature elevations to nearby locations on polyline (grabbing vicinity point data, including snapping them to polylines and the like), this is the tool to use. populate polyline vertices with elevations from nearby point features, allowing either 'move & snap' or 'inherit elevation only' operations. Where can you put these commands to use? This post attempts to explain the various tasks that can be achieved by this command. You will need to try, test and understand the options before you can apply this to your exact editing requirements. These two commands have been explicitly requested by the CAD guys at Optus Telecom, Australia and their network of survey sub-contractors, who have been one of the power users of GeoTools and CADPower, both under the AutoCAD and Bricscad platforms. In a typical surveying situation, you have surveyed locations of one asset class and another set of feature locations nearby and you need to move/snap either to the other based on rules. These two commands is an attempt to put down those rules into a generic command format. In mechanical engineering (CNC programming etc), point-cloud data processing situations and similar CAD operations also, you may encounter situations where these kinds of editing operations find use.